Nokia N93 is a multimedia gaming smartphone that intends to be both an advanced mobile phone and digital camera. Nokia N93 features improved camera capabilities compared with the earlier N90, and is the most advanced camera phone from Nokia to date. Nokia N93 has a 3.2 megapixel camera with Carl Zeiss Vario Tessar optics, flash and 3x optical zoom lens plus 30 fps DVD-like VGA-resolution video recording capability, 320 x 240 pixels 262,144 colors 2.4” LCD display, and powered with TI Omap2 2420 processor which supports fully hardware accelerated PowerVR 3D graphics from Imagination Technologies such as OpenGL ES 1.1 and M3G. The phone also features direct TV out connectivity, easy video creation and burning to DVD with Adobe Premiere Elements 2.0, digital image stabilization, close up mode, infrared, Bluetooth, Visual Radio, SD card storage slot, Wireless LAN 802.11 b/g, 3G on WCDMA 2100 MHz, EDGE, tri-band GSM of 900/1800/1900 MHz networks, Java MIDP 2.0, Symbian application support and UPnP (Universal Plug and Play) support. LetsGoDigital concludes that the Nokia N93 is not the most compact mobile phone to take with you. Due to it’s somewhat bigger size and it’s rather high weight a bag would be handy to carry it around in. It is not a mobile phone designed for the compact mobile phone enthusiast. The built-in camera of the Nokia N93 is a certain step towards quality. 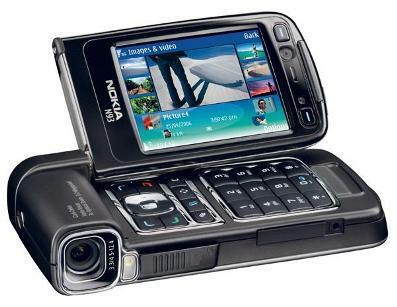 During Photokina 2006 the new Nokia N95 was introduced. A very compact en stylish mobile phone with a recording resolution of 5 Megapixels. Undoubtedly a model we will be hearing more about. The Nokia N93 Cellphone remains to be a different model, with a high functionality. One of the biggest pluses is the battery power, making extended work with the phone possible. The screen is ideal, well organized and practical in use. Summarized, the out of the ordinary Nokia N93 features a lot of interesting functions and despite the above downsides remains a recommendation. All About Symbian compares Nokia N90 and Nokia N93, concludes that the typical buyer of the N93 won’t be that interested in running games or web browsing or listening to music. He or she will buy it to split duties between phone, camera and camcorder, and I’d expect them to use a 2GB card for maximum recording time, with no other files on the card. The N90 buyer, on the other hand, wants a good camera, it’s true, but knows there’s more to a smartphone than being a makeshift digital camera, and will be using office and PIM applications, games, music players and so on. It’s a very different scenario for a very different device. moblog UK (dead link) says you don’t buy N93 because of the lens cap where it’s tiny, it’s plastic, it only fits on one way round (making it fiddly to replace) and it’s completely detachable and you will lose it almost instantly. Same goes for the USB cable connection cover. And, it’s big and heavy. Like, 1996 big. During a call, when the speaker is in the right place to be heard, my chin barely reaches the top of the keypad. Using it makes me feel like a tiny person in a land of giants. Heavy like I had to tighten my belt to stop my jeans falling down when it was in my pocket. The reason to buy is video. The one thing that makes this handset stand out is it’s awesome (by phone standards to date) video recording capabilities. If you’re a video fan and if you don’t already have a pocket sized digital camcorder, or you want to be a video fan and don’t have a camcorder – maybe you should consider this phone. Consider it quite hard, and do go and test it out in person, because it does one thing well, and a lot of other things not quite as well as it should. Gadgetell concludes that N93 is a great phone not meant for the average user – but certainly would not displease the average user. It packs a punch and if you’re not one to care about features then this is not for you. The price my seem extreme but if you were to take an iPod video roughly priced at $250.00, and 3.0 megapixel camera roughly priced at $200.00 and a Sony Handy-cam roughly priced at $500.00, this phone is actually a bargain. If this phone was a celebrity It would be a mix between Bill Gates and Steven Spielberg. It doesn’t have the looks but its certainly packs the brains as well as the creative muscle. The introduction of the DVD style video, a high intensity 3.2 mega pixel camera, and even an option to listen to radio. With all its feature and an extensive imagination, there is nothing this phone can not do for you.